Leland W. Carr was born on September 29, 1883, on a farm in Livingston County, Michigan. He attended Michigan State Normal College at Ypsilanti, and then enrolled at the University of Michigan Law School. Upon his graduation from law school and his admission to practice before the Michigan Supreme Court in 1906, he entered the private practice of law in Ionia. Carr’s first experiences with public service were in the schools. He taught school and was superintendent of schools in Marine City in the years 1906 to 1908, and for the next two years was superintendent of schools in Ely, Nevada. 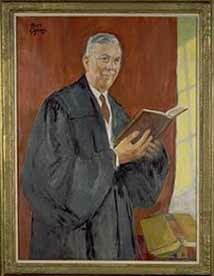 He was appointed to the Supreme Court by Governor Harry F. Kelly in 1945. While in Ionia, he served as an Assistant Prosecuting Attorney of Ionia County. In 1913, Carr was appointed Assistant Attorney General, moving to Lansing, where he remained for the rest of his life. In 1921, after serving as an Assistant Attorney General and as a legal advisor to the State Highway Department, Carr was appointed to the Ingham County Circuit Court by Governor Alex J. Groesbeck – a post he filled until his appointment to the Michigan Supreme Court by Governor Harry F. Kelly in 1945.